Ever found yourself throwing ball after ball to your fetch obsessed dog wondering when they will tire of the game? The answer is NEVER people. Dogs love fetch, and we love our dogs – so iFetch have come up with a way where we get a break and our dogs get to play all day long. 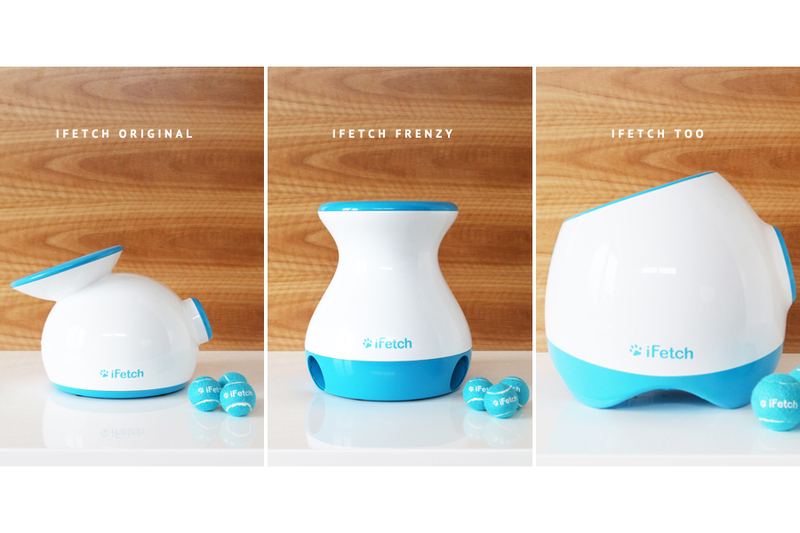 Forget the guilt that you have when you’re tasked with cooking dinner OR playing with your pup – iFetch lets you do both. Stuck inside after days of raining and can’t face the muddy park again? Hello iFetch. Love playing with your dog but don’t want to tire before they do? Yep you got it – iFetch. The original iFetch is an interactive automatic ball launcher – to put it simply, you pop an iFetch 40mm tennis ball in the hole at the top and it shoots it out the front ready for your dog to fetch. 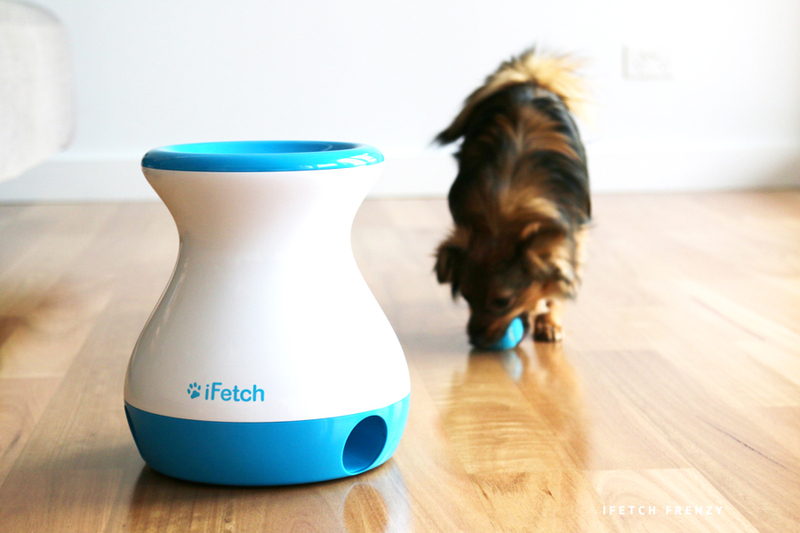 With the ability to be used indoors and outdoors, the iFetch allows your dog to play fetch all day long. You can play with them – by simply popping the ball into the top funnel and watching it shoot out the side…OR (and this is where the magic happens!) you can train your dog to return the ball to the iFetch themselves where the ball will be launched straight away. That’s right, your dog can literally play fetch to their hearts content while you sit on the couch keeping up with the Kardashians. “HOLD UP!” you say, “What if my dog doesn’t learn how to return the ball? ?” Never fear – Whether your dog is a fetching king or this is their first time playing, iFetch has simple training tips and videos to teach your dog to return the ball themselves in no time. In fact – it’s actually a GREAT way to help your dog learn the principles of recall and fetch. The iFetch launches one ball at a time and has the option to throw balls 10, 20 or 30 feet, depending on the size of the area you’re playing in. It can be powered through directly plugging into the wall or inserting 6 C Batteries. 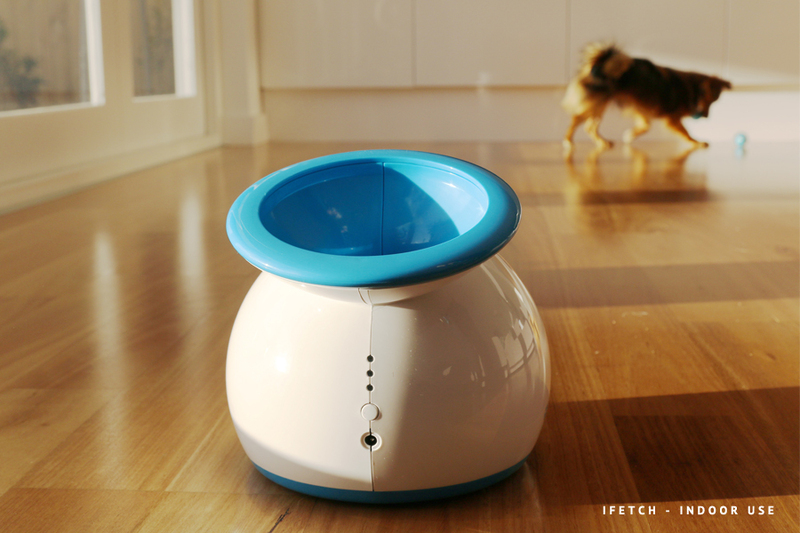 And for those playing along at home – the iFetch lasts 30 hours non-stop on batteries. It will outlast your dog for sure! The iFetch makes a small whirring noise when launching the ball, which is pretty quiet, yet also is a great reminder for your dog that the ball is coming. I was originally concerned dogs may be so ball obsessed that they could stand in front of the launcher and get hit, but the sound of the ball launching made all our dog testers stand back and wait for the ball to be shot into the air. During our review we found all of our dogs quickly worked out that their dreams of non-stop fetching had arrived. Some did a happy dance waiting for the ball to launch. Others ran around excitedly trying to guess where the ball would go next. I also can’t underestimate just how much fun the iFetch is for not only the dogs but all of us. It’s a fun way to get children involved in fetch and playing with their favourite pets. It’s a fabulous way for owners, who are incapacitated and unable to play fetch, to play with their dogs. 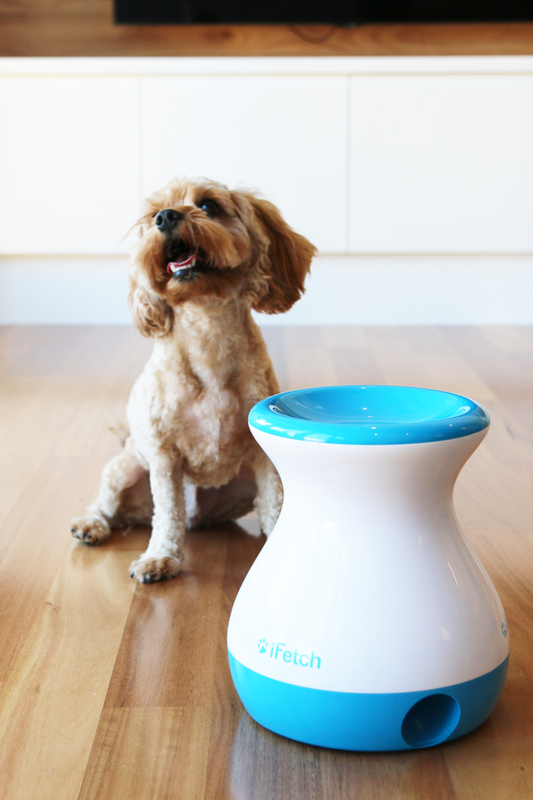 For ageing owners, or people with joint pain, the iFetch is a godsend. Truly it’s a marvel of a product and I can see why it’s won so many industry awards. Now if you thought I loved the iFetch Original, I want to marry the iFetch Frenzy! What’s there to love about it? Oh so many, many, many, things. 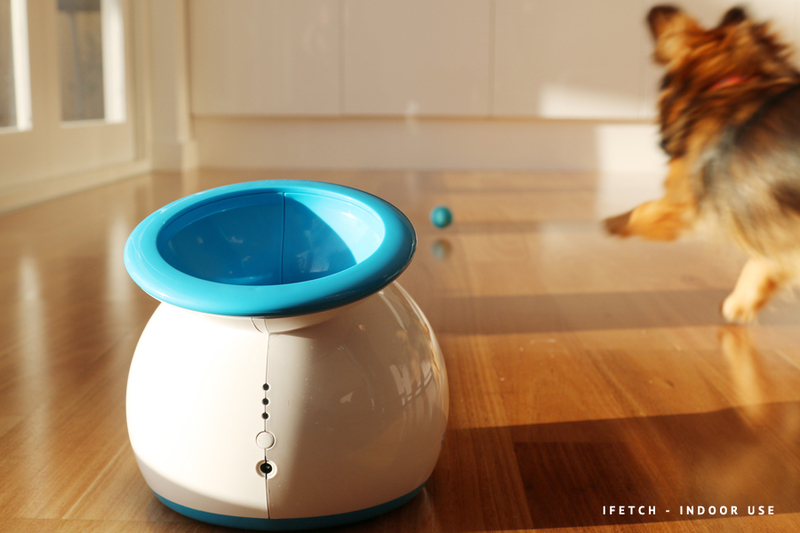 First up, the iFetch Frenzy goes beyond being an automatic ball launcher. 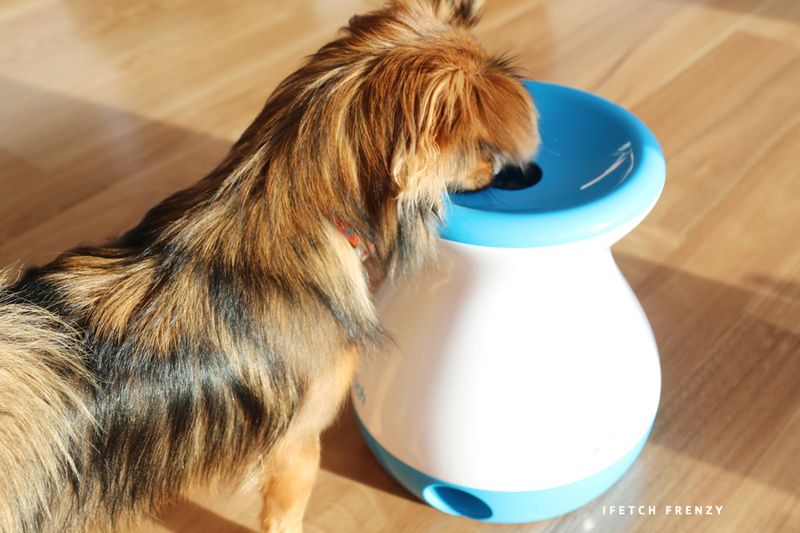 Through a quirky and clever design, the iFetch Frenzy engages your dog on a physical and mental level. Instead of ‘launching’ the ball like the original iFetch, when you pop the ball into the top of the Frenzy it randomly comes out 1 of 3 chutes at the base – keeping your dog guessing right til the very end! Working on gravity alone, the iFetch Frenzy has no need for power or batteries and is perfect for indoor and outdoor use – you just need a flat surface. Even for dogs who aren’t big fetch players, the Frenzy keeps them engaged and occupied – they never know which chute the ball is going to roll out of! During our test trials, you could see the dogs actively trying to predict where the ball would come out – some with major excitement and others you could see the wheels turning in their heads trying to work it all out. They loved it and couldn’t get enough. Just like the original iFetch, you can train you dog to return the ball to the iFetch Frenzy and they can play happily without requiring any physical action from you. You can cook dinner, reply to emails, work out or just sit on the couch in your underwear eating pizza and binge watching the latest season of Orange is the New Black (which I have NEVER done)… Set up the iFetch Frenzy and you have all the time in the world while it does all the hard work for you. Both the iFetch and iFetch Frenzy are ideal for apartments as well. With shorter launching distances and less force, they can be used in smaller areas – which make them a godsend for apartment dwellers with pups. The Frenzy make absolutely zero noise as well, which will keep your neighbours happy. Last but not least, serving the organised, tidy part of my mind, I loved the hidden compartment in the base where you could keep all 3 balls. It just made it perfect for packing away without any messiness or lost balls. For me, the iFetch Frenzy was everything the original iFetch was and more – great for small-medium dogs, brilliant for their minds and bodies, perfect for time poor or incapacitated owners, and just FUN for everyone all round. 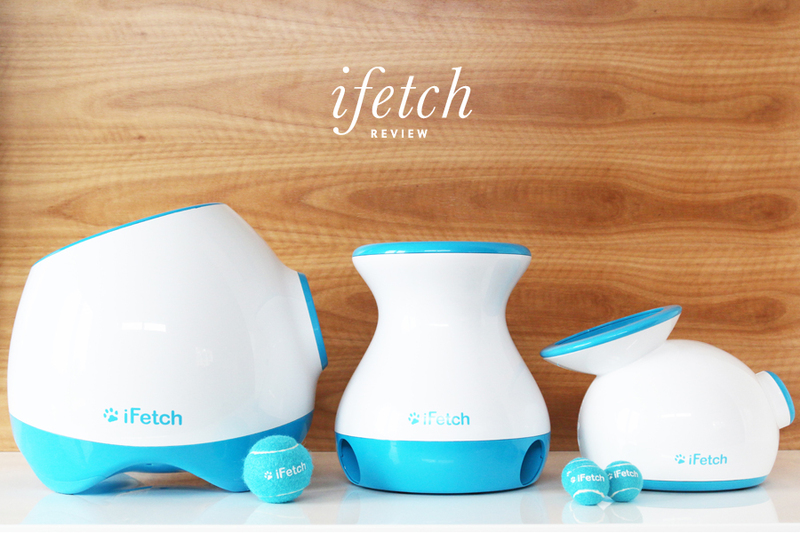 Last but not least, we’ve got the iFetch Too which is the top pick for larger breed dogs. With the little balls of the iFetch original too small for most bigger dogs, the iFetch Too uses a larger ball 2.5 inches in diameter – which fit perfectly for your Borer Collies, Beagles, Staffies or any pup that loves to fetch! 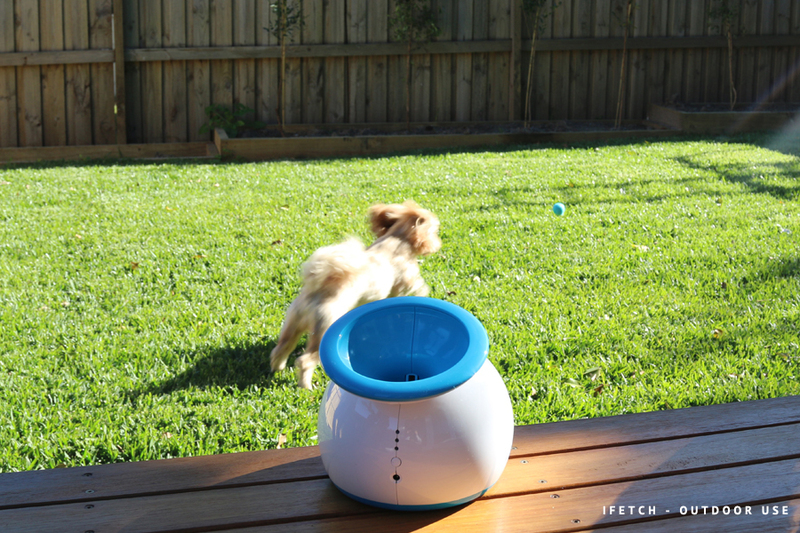 Unlike the other two games, the iFetch Too is all about launching the ball a long way…so unless you live in a large open plan space, you’re going to want to launch this baby outdoors. 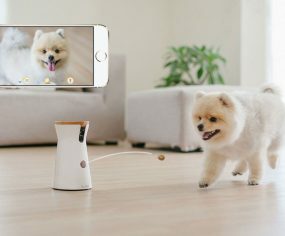 Working just like the original, either you or your dog can drop the ball into the iFetch and let it automatically launch – the iFetch Too can throw the ball 3, 7 or 12 metres. You can set which distance you want it to throw or set it to random to keep your pup guessing! With a built in rechargeable battery, the iFetch Too can be taken to the park, on holiday or wherever your dog wants to play fetch – it’s totally portable. 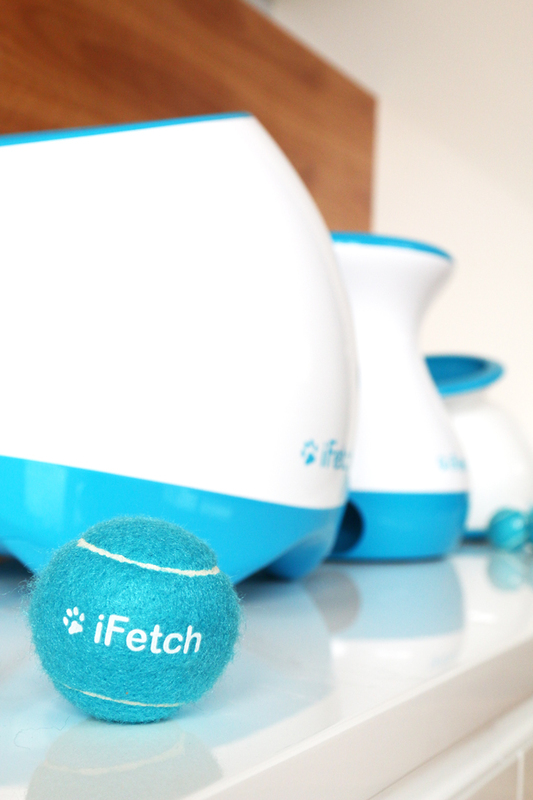 So if you’ve got a big dog that loves fetch, they’re going to LOVE the iFetch Too. WHICH IFETCH IS RIGHT FOR MY DOG? 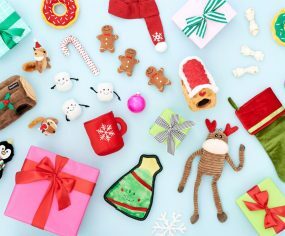 If you’re like me and love all three iFetch toys, never fear! Most dogs will enjoy all three toys depending on which size of ball they prefer. 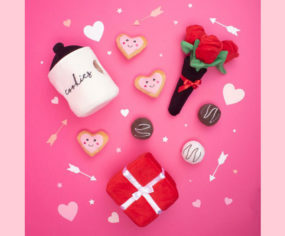 Unique, highly engaging and FUN dog toys. Can be used with you as an active or passive participant. Exercises your dog’s mind AND body. Large range of 3 toys to choose from to suit your dog’s size and activity levels, as well as the size of your home. Durable, portable and easy to clean. iFetch Frenzy requires NO power – works on gravity alone. iFetch and iFetch Too run on varying power sources: include direct plug in, charge-and-go and batteries. iFetch Balls are non-abrasive on dog’s teeth and replacement balls available for purchase. Great price point – starting from $89.95 for the iFetch Frenzy. Dogs of all sizes and ages. See our infographic above for which iFetch is right for you. Dogs that have a lot of energy or active minds. Puppies or dogs training to recall – the iFetch is a great training aid. Great for indoor play on rainy and cold days. iFetch Frenzy and iFetch Original ideal for apartments. 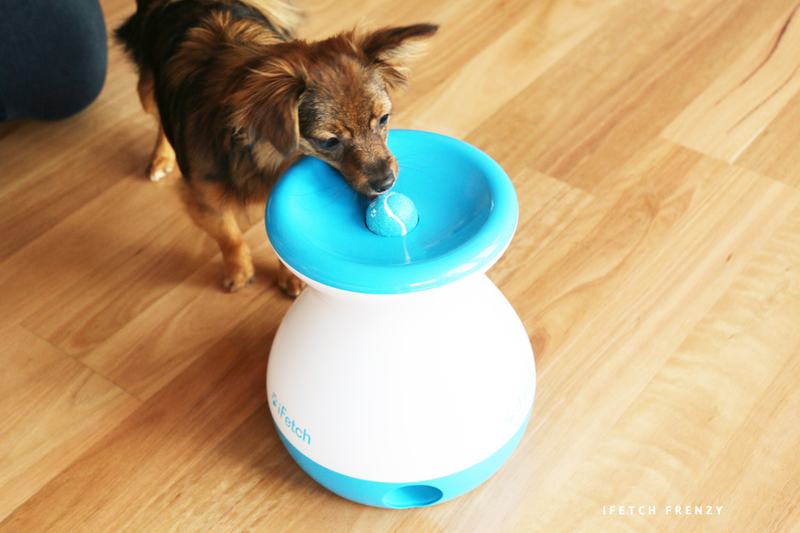 Family pets – children enjoy the iFetch as well! Dogs with owners that may have physical limitations throwing balls or playing fetch. We have now a fairly easy process for fixing your tennis elbow difficulty having an effortless option.